This is Carnival season (culminating on Tuesday, Carnival Day) and people involved in public events like big parades and street parties know that it is a good idea to keep the most elaborate props and materials and recycle/upcycle them in future celebrations (in a way the same practice happens in films that feature historical costumes: the later are usually preserved in the archives of tailoring houses working for the theatre, opera and cinema to be reused as secondary costumes in other films...). At times when watching a fashion show you wonder if certain props and elements are kept in storage only to be reused when needed: at least that's what happened when some members of the fashion crowd (who still have a good memory) saw the chequered yellow and grey floor at Off White's A/W 19 runway, that took place during Paris Fashion Week. 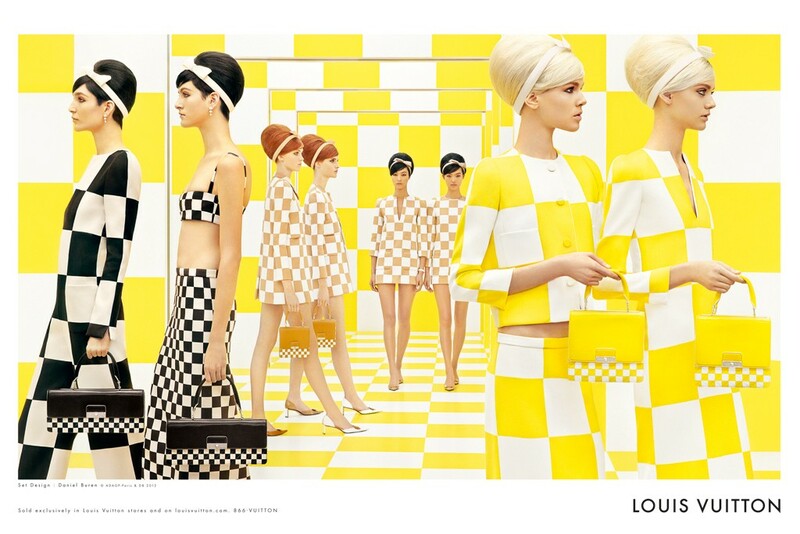 The carpet evoked indeed the acid yellow and white chequered floor of Louis Vuitton's S/S 13 runway by Marc Jacobs. In the case of that collection (that seemed to have some strong connections with designs from the '60s...), the idea for the yellow and white/black and white chequered motif (View this photo) came from Vuitton's Damier pattern, reinterpreted via Daniel Buren's grids. Did Off White's Virgil Abloh, current artistic director Louis Vuitton's menswear, move from those designs for the yellow and grey and black and white designs in his A/W 19 collection? Abloh actually explained the colour combination for the runway carpet and the prints for his designs such as billowy gowns, coats and micro-shorts, came from race cars (an inspiration that seems to be dear also to Miuccia Prada) like the Nascar and from the chequered flag (a metaphor for his own fast and faster career towards success?). While the draped and wrapped motifs were inspired by twisted and crushed car-crash sculptures (John Chamberlain's? ), the shorts matched with a coat and the overalls in a fluorescent green grid on a black background were vaguely reminiscent of Thierry Mugler' "Anatomique Computer" suit (A/W 1990-91 collection). The check patterns inspired graphic squares on padded coats and bags and an Op Art motif on sweaters. 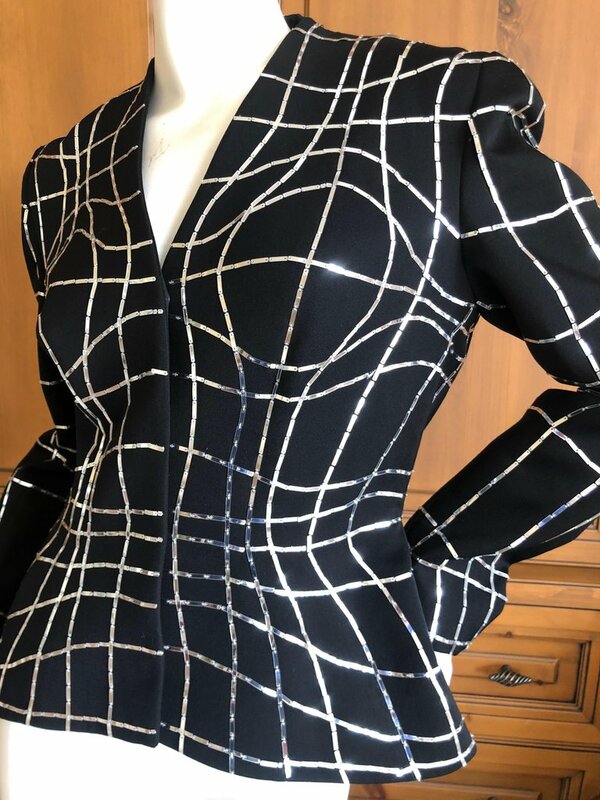 The motif was reminiscent of the distorted sequinned grids in Mugler's A/W 90-91 jackets (View this photo), but was also reminiscent of Vasarely's Op Art spheres and the Ouchi illusion (after Japanese artist Hajime Ouchi), with its rectangular checkerboard patterns oriented in orthogonal directions, as reinterpreted by Professor Akiyoshi Kitaoka in his mind-warping Op Art images that alter visual perceptions. Virgil Abloh seems to have been honing his skills and focusing on deriving his designs from other collections or artworks, rather than on blatantly copying them. But will he try to copyright his yellow and grey, black and white chequered patterns as he did with the black and white diagonal stripes or try and appropriate Op Art motifs and make them pass for his own? Only time will tell.